E-Waste or electronic waste are the disposed electronic devices. As a company that focuses mainly on electronics, I have a duty to help spread the word of this growing problem. Not only does the waste harm the environment, but the metals themselves are valuable. Below are 11 facts about e-waste I find especially interesting. Courtesy of dosomething.org. In 2009, discarded TVs, computers, peripherals (including printers, scanners, fax machines) mice, keyboards, and cell phones totaled about 2.37 million short tons. 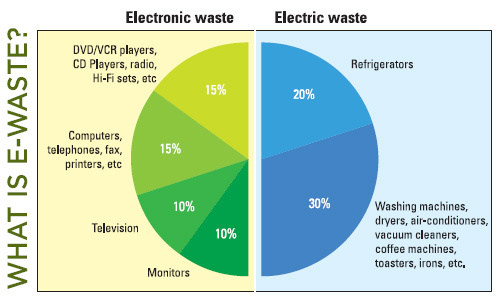 E-waste represents 2% of America’s trash in landfills, but it equals 70% of overall toxic waste. Electronic items that are considered to be hazardous include, but are not limited to: Televisions and computer monitors that contain cathode ray tubes, LCD desktop monitors, LCD televisions, Plasma televisions, Portable DVD players with LCD screens. If you have any e-waste that needs disposal, take it to a reputable recycling location. Help out your future humans. We will also take any e-waste you need recycled, and will actually buy any empty toner cartridges you want to get rid of.